Are you hyped for this MASSIVE country concert?? We sure are!! 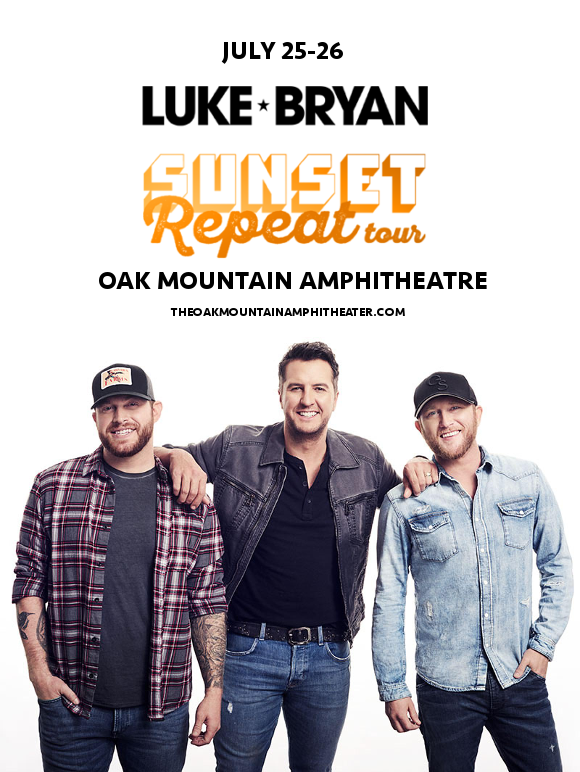 Get ready to catch Luke Bryan, Cole Swindell and Jon Langston LIVE as they come to Oak Mountain Amphitheatre on Thursday 25th July 2019 as part of Luke Bryan’s Sunset Repeat Tour!! It’s going to be an epic show – be sure you don’t miss it!! Book now to be sure of your place at the show!! As one of the biggest stars in country, Luke Bryan needs no introduction. His most recent album, “What Makes You Country,” hit number one on the Billboard 200, and included the singles; “Light It Up,” “Sunrise, Sunburn, Sunset,” the inspiration for the 2019 tour title, and the number one Billboard Country Airplay hit “Most People Are Good”. It’s true – Luke Bryan concerts bring people together and create a sense of unity in a way that’s unique even for a big country star. Are you ready to experience that special feeling for yourself?? There’s only one way, so don’t wait a second longer – grab your tickets to see Luke Bryan while you still have the chance and get ready for a concert you’ll never forget on July 25th 2019! !